In 2005 a spokesman for Silverstein Properties stated "pull it" referred to withdrawing firefighters from WTC 7, but this statement does not withstand scrutiny. "That building right there, the brown building, the tall one, is number 7 World Trade Center." "We've heard several reports from several different officers now that that is the building that is going to go down next." "In fact one officer told me they're just waiting for that to come down at this point." 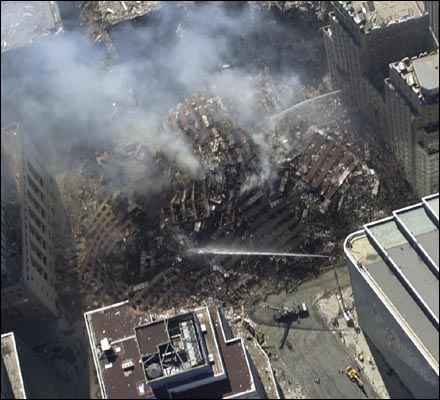 The fires in WTC 7 were not evenly distributed, so a perfect collapse was impossible. Heavy duty explosives were in the building. Silverstein spoke to his insurance carrier about demolishing the building. Silverstein said to the fire department commander "the smartest thing to do is pull it." Firefighters withdrawing from the area stated the building was going to "blow up". News media outlets had foreknowledge of the collapse. An explosion can be heard prior to the building's penthouse collapse. Cutter charges can be heard immediately before the collapse. The building collapsed perfectly into its footprint at freefall speed. There can be only one conclusion as to what happened to WTC 7 - it was demolished. When and why was the building rigged for demolition? Moreover, why does the heat signature of the twin towers' wreckage match that of WTC 7? The Collapse of WTC 7: "A Wholesale Loss of Documents"